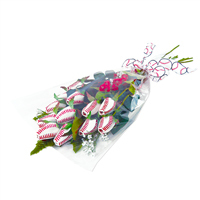 Hit a "Home Run" in the heart of a baseball loving sweetheart with a bouquet of six Baseball Roses. A bouquet of flowers is a timeless gift, but now with Baseball Roses, you can swing for heart with baseball themed flowers. 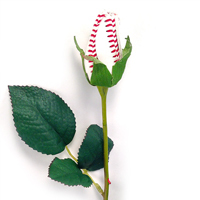 Baseball Roses feature petals handmade from genuine baseball leather and we will arrange six Baseball Roses into an unforgettable bouquet that lasts a lifetime. 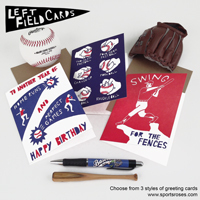 Your sweetheart will love showing off their passion for baseball year round. 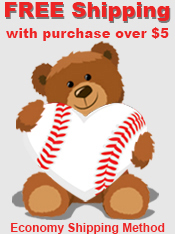 We will accent the arrangement with sparkling hearts, a Valentine's Bear (actual color may vary based on availability), and baseball-themed Valentine's Day greeting card. The Baseball Rose Valentine's Day "Home Run" Bouquet is a perfect gift for baseball fans, players, team moms, and coaches. And it's the only bouquet suited for both men and women. From Erin Feerick of Philadelphia, Pennsylvania on 2/21/2013 . Excellant my husband loved the gift! Upgrade to a full dozen Baseball Roses and get Free Shipping!